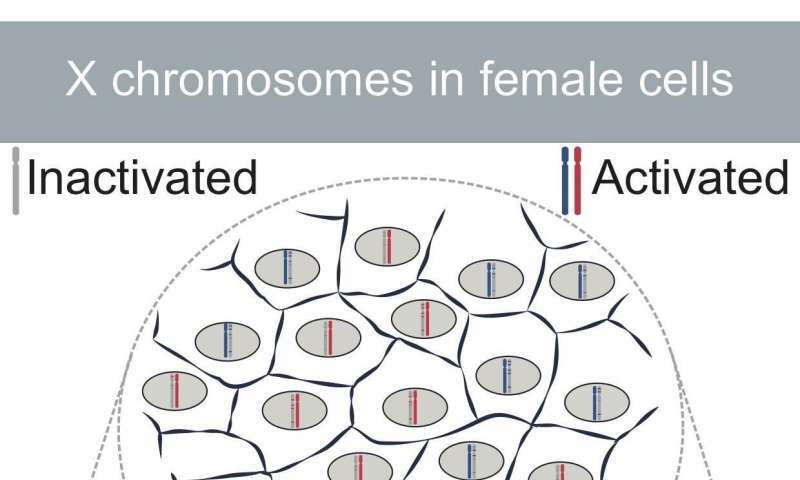 In cell biology, men and women are unequal: men have an X chromosome, while women have two. How can we get around this difference? Geneticists from the University of Geneva (UNIGE), Switzerland, turned to some historic research dating from the 1960s to sequence skin and blood cells one by one. They observed how the second X chromosome in females gradually becomes inactive in order to avoid an overdose of genes encoded by the X. They also found that several genes bypassed this inactivation, which varied according to the tissue and life phases of the cell. The UNIGE research explains the inequalities noted between men and women regarding genetic diseases. You can read all about the results in the journal PNAS. DNA is made up of genes that are then expressed by RNA before ultimately being translated into proteins. RNA, therefore, is the intermediate product of the proteins present in our cells. "Our laboratory has designed a pioneering technique, called single-cell allele specific RNA sequencing, which means RNA molecules can be sequenced cell by cell for the first time and not by tissue in its entirety," explains Christelle Borel, a researcher in the Department of Genetics and Development in UNIGE's Faculty of Medicine. This detailed analysis can be used to quantify what happens in each cell individually and, it follows, gene by gene. The team headed by Stylianos Antonarakis, emeritus professor in the Faculty of Medicine, investigated the random inactivation of one of the two X chromosomes in women, which was discovered back in 1960 by Mary F. Lyon. The British researcher was the first person to demonstrate that women have two X chromosomes, unlike men, and that one of them stays silent through a mechanism for correcting the gene dosage, compensating for the presence in women of an extra copy of the genes located on the X chromosome. In the 1990s, however, scientists found that some genes in the inactivated X chromosome avoided this inactivation. But how? The UNIGE researchers sequenced 935 skin cells and 48 blood cells from five different women so they could analyse the phenomenon in more detail. "We first individualized the cells and ascertained the genes expressed in each cell," says Federico Santoni, former researcher in the Department of Genetics and Development of the Faculty of Medicine of the UNIGE and now researcher at the CHUV in Lausanne. "Then we sequenced the genome of the five women and with bioinformatics, we were able to identify which X chromosome in each cell was activated and which was silent." Until recently, experimental techniques did not have the sensitivity needed to precisely measure the gene expression rates that escape inactivation. Now, however, thanks to the experimental and bioinformatic approach developed by UNIGE, the geneticists have identified 55 of these genes, including five that were still unknown. "Our main discovery was that no X chromosome in all the cells analysed is 100% inactive; the rate varies from cell to cell," continues professor Antonarakis. The inactivation of the X chromosome is initiated by the expression of the XIST gene. "This gene produces small RNA molecules that surround one of the two X chromosomes, forcing the genes on this chromosome to stay silent. We've shown that the more XIST RNA molecules there are on this inactivated chromosome, the more silent its genes are and vice-versa. The expression of this gene explains the variable level of inactivation between the cells." XIST is, therefore, the key gene for the inactivation of one of the two X chromosomes in women's cells. But it isn't the only one. "For the first time, we uncovered five other genes that play an important role in the X chromosome inactivation mechanism," says Borel. "This will help us understand what happens at the molecular level during inactivation. Even more importantly, it means we can expand our investigations to learn more about the differences between men and women across a range of diseases." X inactivation: a new understanding for genetic diseases? There are many diseases that are caused by genes located on the X chromosome, such as haemophilia, intellectual disability syndromes and developmental disorders. "During our research, we also discovered that X chromosome inactivation varied according to the different life phases of a cell and according to cell type," adds professor Antonarakis. "This could account for the differences seen in the severity of certain diseases between patients, the age of onset of and why some tissues are targeted by diseases." Based on these results, the researchers will be able to highlight the mechanisms behind the heterogeneity of genetic diseases.